With the decision to perform a network analysis, the Institute for Cultural Policy entered new territory within the framework of cultural development processes. During the process it was planned to highlight previously unknown communication and conflict structures between different stakeholders from politics, administration, arts and culture as well as economy, tourism and civil society. Additionally, so-called white spots (“structural holes”) between representatives of various sectors should be identified. Stakeholders of all relevant domains would be interviewed in order to implement effective coordination structures within the two counties Hildburghausen and Sonneberg. In order to achieve these goals, the Institute for Cultural Policy engaged Robert Peper, a PhD-student from the Leuphana University of Lueneburg, who is trained in visual social network analysis. By using Net-Map, the network structures between actors of culture, politics, administration, business and civil society could be traced in a very participatory process. In the beginning of the interviews respondents were asked to recall the last three months of their daily interactions with other stakeholders with regards to their cultural work. They were then asked to draw actors on a network card using a large sheet of paper and pens. For this process, standardized name generators were used. In the course of the conversation ego-alteri (connections between interview partner and others) and alteri-alteri relationships (connection between two others, not involving the interview partner) were depicted in the network map. 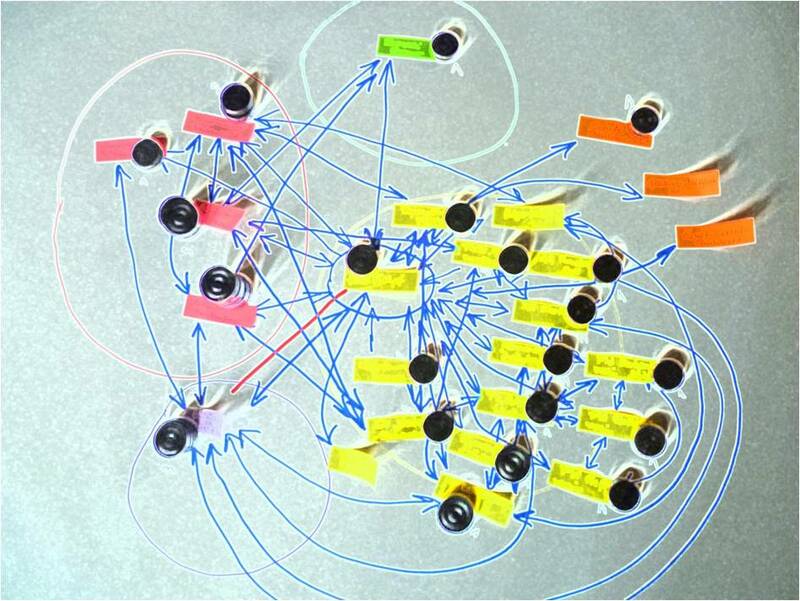 The visualization displayed both the flow of communication as well as the conflicts and future relationships between the actors involved. In order to highlight the most influential actors in the decision making process, the interviewees were asked to mark the influence of individual actors by heightening the respective tokens. The evaluation of the network analysis, which included 14 Net-Map-interviews with politicians, tourist officers, artists, museum directors among others, revealed surprising findings. Key players and core interactions were identified that were previously unknown but are crucial for the future cultural development of the model region. A regional tourism association appeared as an extremely well-connected node and as an important potential strike for cultural operators in order to obtain access to the business sector. In addition, the regional mayors turned out to be the lynchpins of the collected network, which comprises a total of 167 players. Missing relations could be located e.g. between artists and schools. Many local actors spotted developing a denser network between cultural and educational sectors as the most important task for the future. 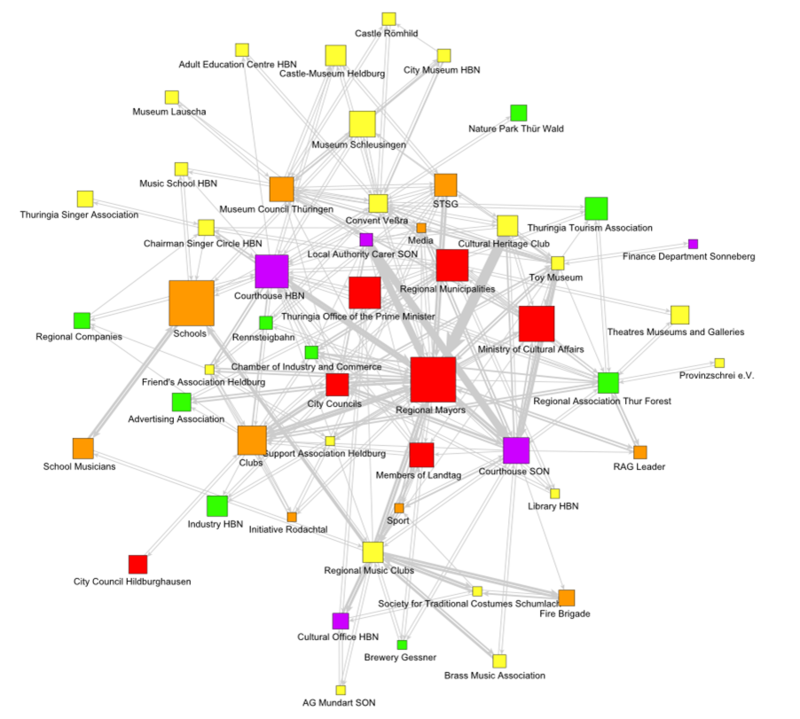 The advantage of this Net-Map-based network analysis lies in the possibility to highlight the most important formal and informal interactions of cultural governance processes and to identify gaps in the network structures that need to be closed in order to pool resources and to strengthen communication and decision-making processes for the cultural field of a whole model region. These expectations were fully met with the results of the recently published report. The study served as an important additional tool for the whole cultural development process (which also involved many other tools such as expert interviews, structural analyses, workshops etc.) and was presented at the occasions of different cultural workshops. The process ended in April 2015 and can now be seen as a good example for a modern approach with regards to cultural development planning.